September Sea sails to Newfound Harbor. You never know what you'll discover when sailing. 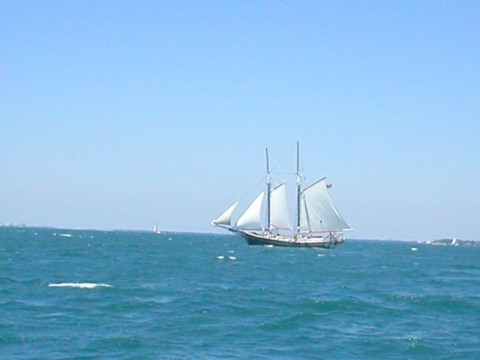 What a beautiful Schooner. To enter Newfound Harbor, you turn north past Little Palm Island. Little Palm Island, a most exclusive and secluded island of luxuriously totally stress-free accommodations (no televisions, alarm clocks or telephones anywhere on the island), located at the west end of Newfound Harbor Keys, where the Gulf of Mexico meets the Florida Straits, is approximately five miles long. It is known for having nearly 30 different types of palm trees, and even more famous for being the location where the movie "PT-109" was shot (starring Cliff Robertson as John F. Kennedy). No membership required, but they have a $350.00/per night minimum for dockage (they have, of course, wonderful cottages and rooms too). It is a romantic and fabulous get-away island... the rich and famous go there and so do we who save up our pennies for one hell of a fantastic romantic vacation in luxury. Call 1-800-GETLOST for reservations (LOVE their digits)! Looking at Newfound Harbor from September Sea's cockpit. Charmaine awaits Bill to join her in Margaritaville for the Sunset. 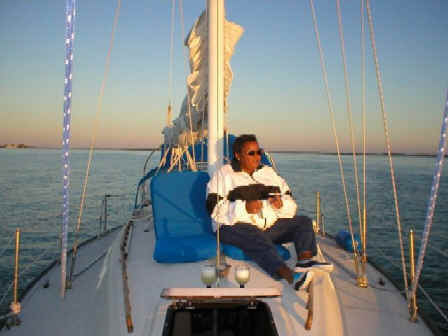 Bill sipping a Margarita and relaxing on deck after watching the sunset. The famous "Sunset Pink" photo taken at Newfound Harbor. This is so beautiful, Honey. But it's time to haul anchor!